Dan, Darren and myself spent the evening exploring some new swims (or wading about in nettles - my hands are still tingling as I write this). 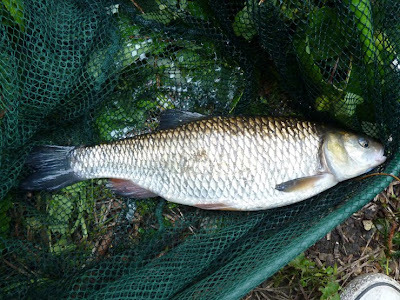 Second spot and I connected to a chub about two and a half pounds (above) then we leapfrogged our way down the river searching for a barbel. We found a few great swims, which will see me chucking a few baits in over the course of the summer. Fishing off a high bank I had a wrap-round bite just as Darren walked past, perfect timing - as it would have been very tricky to net the fish on my own, and a 3lb 10oz barbel. Can't wait to get back down there and give it another go! On a separate note; there's 20% off all Jack's Pike books, simply enter the promotional code CHASEUK at the checkout, hurry offer ends Friday 29th June. Oh yeah, link. 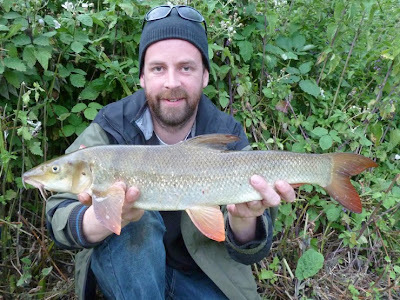 Good going with the Barbel Brian.....despite all the nettles that seem to be about, there seems to be a complete dearth of dock leaves. When I was a kid in Wales they were always growing together.